Successfully Added T99 Android TV Box - 4K, Android 7.1, Quad Core CPU, Kodi 16.1, Miracast, Wireless QWERTY Keyboard to your Shopping Cart. The T99 TV box with quad-core processing is a great device for streaming UHD movies. With an HDMI 2.0 port, this TV box supports the bandwidth needed for 4K UDH resolutions at an impressive 60 FPS so you can enjoy flawless quality. 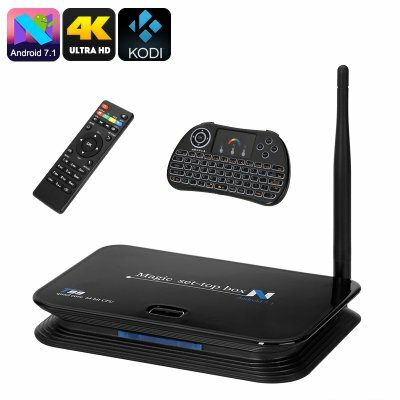 Coming with the Kodi media player preinstalled this smart TV box brings you access to unlimited movies, TV shows and live TV sports all for free over your internet connection. Turn any HDMI screen into a smart TV and enjoy the rich content. Running on Android 7.1 you get better graphics rendering, faster startup times and much better use of memory space. You'll also have all the latest bells and whistles including a more intuitive menus systems and improved Google assistant. The Android 7.1 user interface you have access to millions of applications and Android games. With apps like Netflix, Hulu, and YouTube as well as IPTV streaming services on hand this media hub will be the center of your home entertainment. A USB 3.0 port you'll have faster access times for external storage such as memory pens. There is a micro SD card slot to boost the memory by 64GB and with SPDIF you enjoy great quality audio output to your home speakers or sound system. The T99 Android TV box comes with 12 months warranty, brought to you by the leader in electronic devices as well as wholesale cool gadgets..